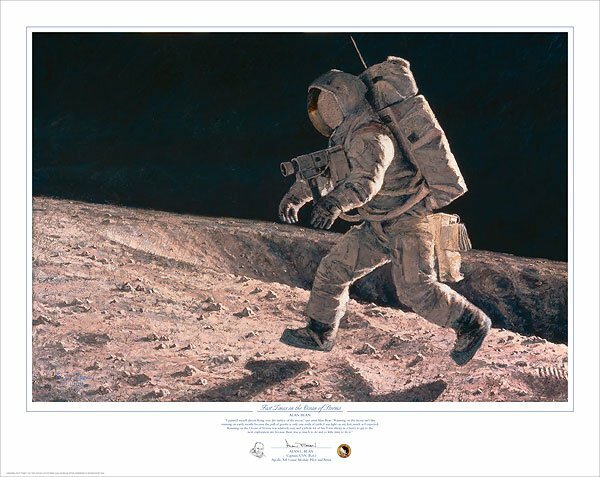 “I painted myself almost flying over the surface of the moon,” says artist Alan Bean. “Running on the moon isn’t like running on earth, mostly because the pull of gravity is only one-sixth of what we feel down here. I was light on my feet, much as I expected. When I pushed off with one foot, there was a long pause before I landed on the other foot, like running in slow motion. I could feel my leg muscles completely relax as I glided along to the next stop. I seemed to float just above the surface. I vividly recall one instance as I was running near a large crater. I felt I must look like a gazelle, leaping long distances with each bound. I looked over at my partner, Apollo 12 Commander Pete Conrad, as he ran nearby. His leaps were graceful and he was space-borne for a long time but, to my surprise, he wasn’t rising very high or leaping far at all. Then I realized that in the moon’s light gravity, we did not have the traction to push hard backwards with our boots. I wasn’t leaping like a gazelle¯it only felt that way.